​We are located at Polychrono village. Villa Natassa - Valentino is a studio/appartment complex 90m in front of the sea in Polyhrono village, in Kassandra peninsula, in Chalkidiki! Each appartment hosts 1-4 people (2 adults + 2 children). Fully equiped! We offer totally free highspeed internet 24/7 and safe parking in case you will rent a car or visit us with your own. Also, you will find a spacious and fenced parking with 7 places, a barbeque and a traditional brick oven next to our enormous olive oil tree kiosk, an enclosed shower, where you can choose either to have a warm bath, or to have a refreshing bath with water from the natural spring water which is coming direct from the mountain, and 2 outdoor showers (hot water or natural spring water). We also offer immediate and FREE pediatrician for pediatric and pathological cases. Every apartment is fully equipped with almost everything you will need! There are apartments with 2 bedrooms that are located in the ground floor and apartments with 1 bedroom, which are located on ground, first and second floor. All apartments have air-condition and a fully equipped kitchen. Balconies are on both front and back sided and are shared (2 apartments on each floors). 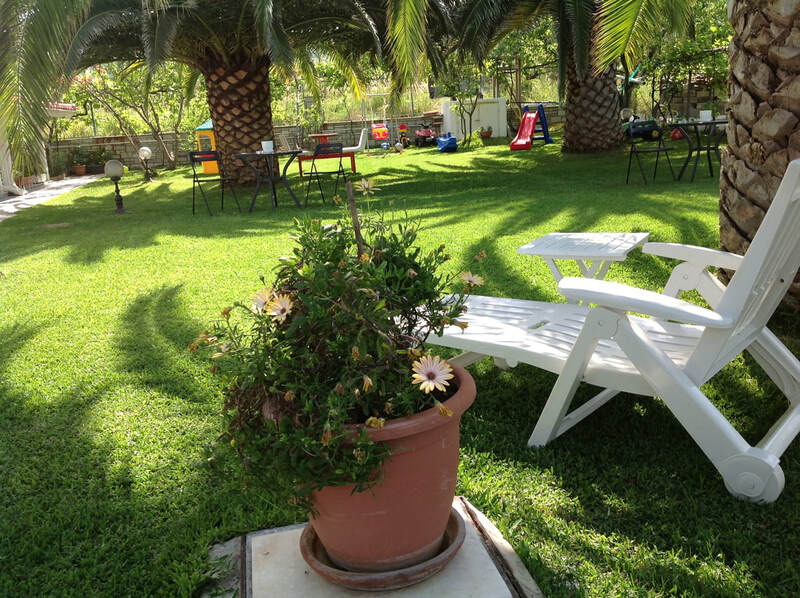 Grass fields have sunbeds, tables kids toys and you are welcome to explore all the surroundings of our property! The barbeque and the stone oven are for your own use. ​And as we say to all of our guests... we love to treat all of our guests like friends&family!